ACTLearn and Learning Lab is continuously expanding its capacities in order to produce state of the art learning experiences. In this newsletter you can read about our most recent deliveries, upcoming products and events, and how you can use ACTLearn and Learning Lab to produce learning material that suits your specific needs. Human Rights Based Approach (HRBA) Training – subject matter experts create online training from traditionally face to face sessions. PMERL Planning Cycle – ACTLearn partners collaborate to make resources for Church of Sweden and create a set of complementary resources. Promoting Site Traffic – DCA gives performance support tools some support of their own in Global Partnership and Donor Relations. Actlearn.org Platform Redesign – we are now gathering input for upgrades to our learning management platform. Read here how to give input. LearningLab, DCA and CoS are currently working on a comprehensive learning solution for strengthening the integration of gender in human rights based development. The content of the course is based on the ACT Alliance Community of Practice (COP) training manual on Human Rights in Development published in 2013. The manual promotes collective learning of NGO staff, but in order to further the use of the manual, there is an urgent need to acquaint more potential trainers in its use. This is where the HRBA online training comes into the picture. Subject matter experts for the project come from both DCA and CoS (Elsebeth Gravgaard and Carol Rask from DCA and Sofia Nordenmark and Carina Björnlund from CoS) and they will also conduct the content of the online training with technical assistance from Learning Lab (LLAB). Allan Kragh and Natascha Link Felix from LLAB are contributing on the project management, setting up actlearn.org sites and with general assistance on structuring the content for online purposes. The HRBA training sessions will run for 6 weeks starting January 2018. If you have any questions about this training, feel free to email Allan at akra@dca.dk. How far can Resource Development Collaboration take us? Maria Möller wanted to find a way to clearly and concisely communicate the planning cycle (Planning Monitoring Evaluation Reporting Learning) at Church of Sweden across the organisation. She found unexpected inspiration when she came across a postcard at a second hand shop that outlined the production cycle for a dairy factory, and she determined that she could do the same for PMERL. Maria immediately got to work drafting visuals that could represent such a complex process and she created many detailed and complex drafts that illustrated specific parts of the cycle. At this point she enlisted the help of Gry Zierau, the creative learning designer in Learning Lab and they began to collaborate online and organise Maria’s drafts into a cohesive concept that, in a simple visual way, could illustrate the context. There was a turning point in the project when Gry came to Church of Sweden for an in-person workshopping day, which is when Maria says “everything fell into place”. Their work that day resulted in a simple and clean poster that by the help of icons, shapes and colors categorised items and graphically told the story of PMERL. After additional feedback and adjustments from other CoS staff, the poster was ready as a process overview. The story does not end here though – all of the work creating the structure and graphics for the poster was upcycled into an interactive elearning model on actlearn.org that CoS staff can use as a resource to get more information on each stage of PMERL. 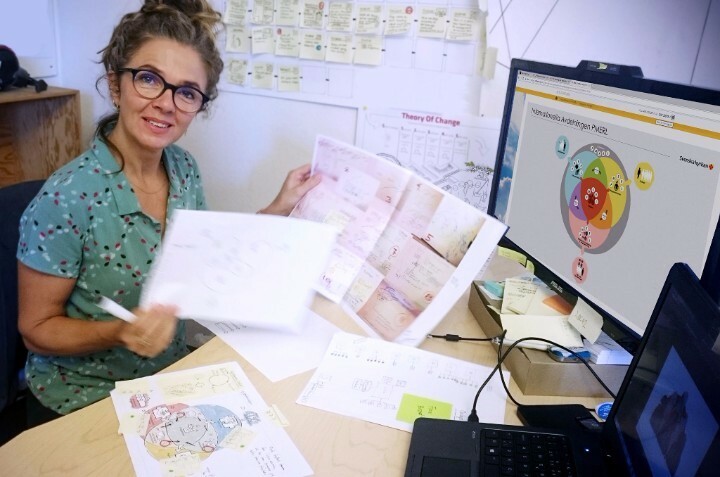 SO… Maria’s subject area expertise and Gry’s visual design and elearning experience came together – and shaped two simple resources that helps CoS and easily guides the international department through a complex method/process. This mix of digital and analog collaboration and cross-organisational partnership is a brilliant example of how we can do more together in the ACTLearn partnership – and share experiences across borders, organisations and languages. For more information on graphic facilitation, you can email Gry at grzi@dca.dk. LLAB's Gry Zierau transforms concept into product after her meeting with Maria Möller at Church of Sweden. How can online tools supplement the personal assistance that advisors offer to partners and remote staff? DCA’s Stine Maria Müller has answered this question with the development of two online actlearn.org sites that support performance in the Global Partnerships and Donor Relations (GPDR) Unit: The Proposal Development Process and the Grants Management Process. Together with LLAB’s Tanja Holst Jensen, Stine designed and launched these resources as a modular walkthrough where users could quickly navigate and locate answers that they need on demand. Feedback from users was extremely positive and so the organisation and design of the sites was a success. The story does not end here though because a new question soon presented itself: how can users be encouraged to use these resources and shift to a blended support model after years of working differently? In other words, the resources were available for use, but potential users were still replying on traditional means of getting answers. Stine then connected with another LLAB staff, Stephanie Rahbek Simonsen, and together they launched a survey to gain insight into the best way to connect the target group with these tools. At the same time, they collected data on how the sites were being used. The results of this evaluative approach were very informative; the target group share useful insight into adjustments that could be made, but there was also an increase in use in response to the survey launch itself. The result? Stine created a communication plan to “nudge” users toward the site to help support the move to using online sources. This new approach has resulted in a steady increase of users as well as user return visits. The lesson learned? Great resources require users, and user habits can take time to change. Stine’s ongoing support of the sites has increased their visibility and that will save GPDR time and improve workflow. If you have any questions about performance support or how to evaluate the traffic in your learning site, feel free to email Stephanie at srsi@dca.dk. The five phases of the Proposal Development Process, each linking to a resource page. The six phases of the Grants Management Process all link to separate pages with resources for each. Did you know that actlearn.org has over 2500 registered users from over 500 different organisations? These numbers alone indicated the power of our shared platform to reach people and share information through blended learning. Members of the ACTLearn partnership have increasingly build their capacity to not only participate in blended courses, but also to design and to build their own sites. Every year we see more trained users in these skills and more learning sites developed. While the platform is doing all of this, there are still many opportunities to optimise the site in terms of design and functionality. LLAB's Christoffer Bengt is currently collecting feedback from users on what to prioritise in the redesign of the platform. If you have any suggestions, please email them to Christoffer at cbjo@dca.dk. Copyright © 2017 Folkekirkens Nødhjælp / DCA, All rights reserved.